and as Mothers' Day approaches I'm again thinking about how much I miss her. Joining in for Vintage Thingies Thursday again over at Coloradolady. 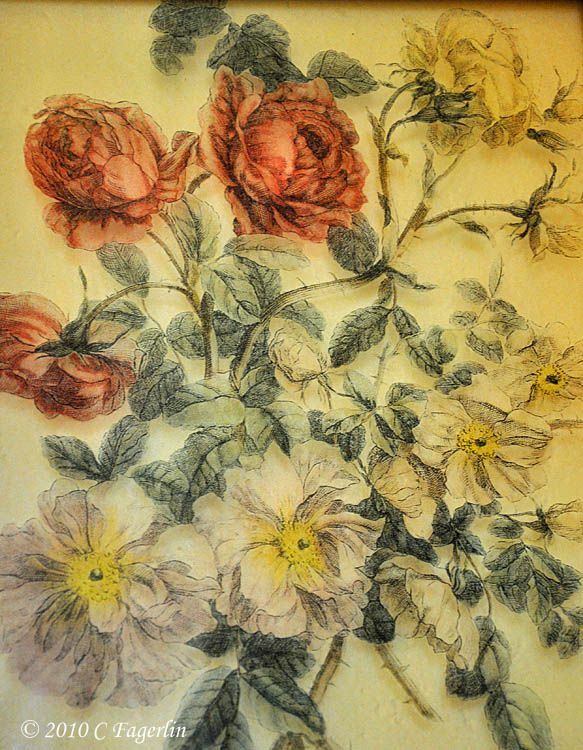 Ida loved to do needlework and she especially enjoyed needlepoint pieces. rocking chair that I'll share another time. The rustic framed pictures on the wall are painted glass framed in old barn wood. 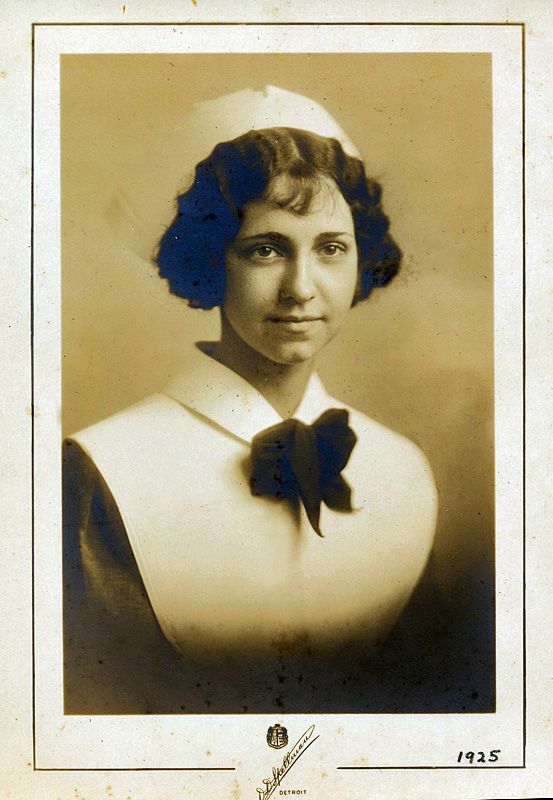 in the 20s and an infant nurse in the 30s before her two sons were born. Do you remember when nurses all wore their starched caps and nursing school pins? Her school pin is here somewhere, just couldn't locate it this morning. original one from her graduation picture. The February post about some of her favorite things. Happy Mothers' Day to all moms, nanas, grandmas and to Ida. What a lovely tribute to your mother. Simple yet says so much. I'm sure she would've loved it! Such beautiful momentos of your grandmother. I adore the picture of her in her cap. The pictures are gorgeous too. Not only is your MIL gorgeous, her work is simply beautiful. 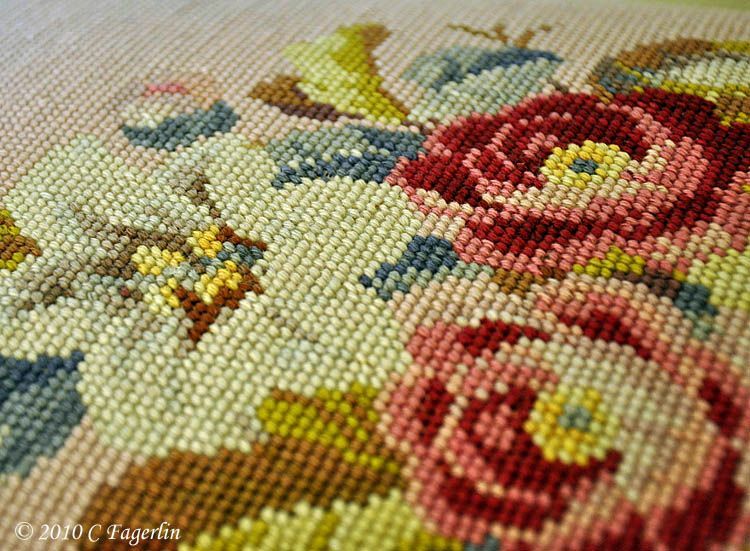 What beautiful needlepoint she did..
What lovely mementos, I love those pictures, and the needlepoint is so pretty! Have a VTT! Your tribute to your mother is just beautiful!! I always miss my mother when mothers day comes around. I don't about you, but things are just not the same without her. The needlepoint and pictures look nice together. I remember the starched nurses caps! What a wonderful tribute to your MIL! What a sweet post and tribute. Your MIL was beautiful and so talented! I was just ooohing and awwing over those painted glass panels and the footstool is exquisite! Thanks for sharing! Beautiful post. I sure do remember the nurses caps. I prized mine more than anything in the world and it took me a long time to stop wearing it. I still have it. I will get it out for one of these. It was so hard to glue the blacks strips on that indicate the type of school you went to. Her needle work is beautiful. You do her great honor to remember her. Thanks for sharing. Your MIL did some beautiful work--that needlepoint is still so colorful and vibrant. I remember seeing those caps when I was little, and we made them out of folded paper when we played nurse with the neighbor girls. Thanks for sharing your wonderful mementos. What a nice post. Your MIL was beautiful and talented. 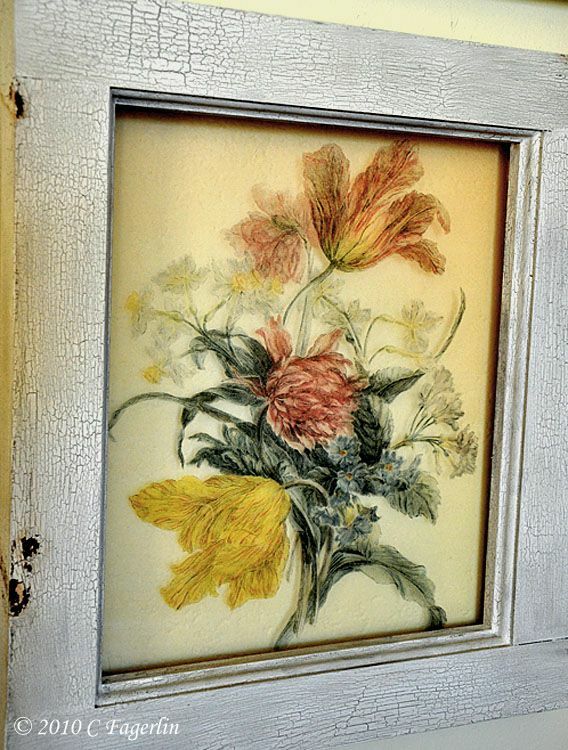 I love the needlework, but what I absolutely love are the pictures painted on glass, such detail. Beautiful! I can only agree with the previous commenters - a beatiful and loving post. You have some wonderful keepsakes of your MIL's! 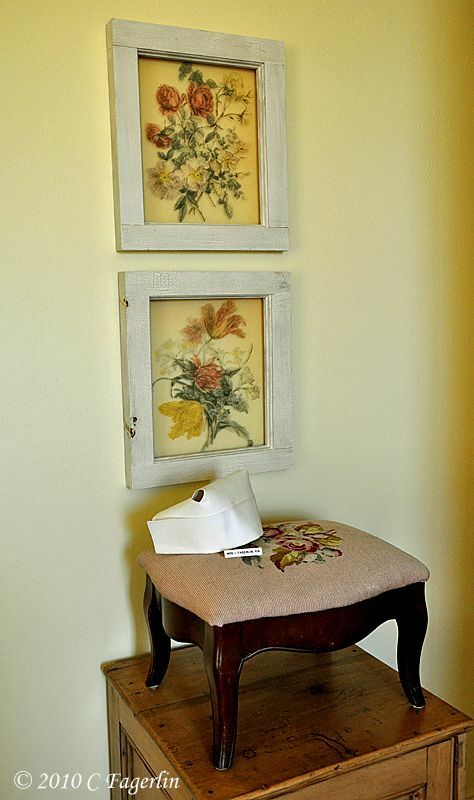 I love that little stool, and I think it's so wonderful that you have her cap too. What a talented lady! It is odd, but I have done a lot of needlepoint in the past and my mother was a nurse. Little did we know we had so much in common. I loved your post today featuring them both. How special! I can't imagine the time and patience that went into her footstool! Thanks for sharing and have a happy day! That needlepoint is so exquisite. She did wonderful work. You have is displayed so beautifully beneath the pictures. 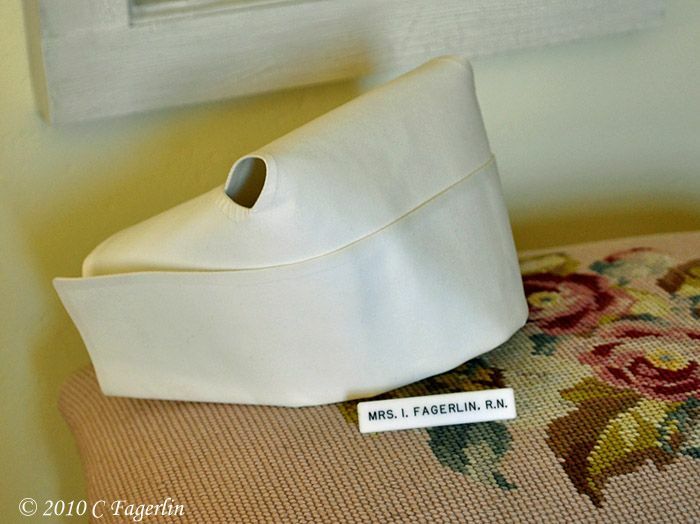 Her nursing cap is great, it would look great in a shadow box with her pin. She certainly was a pretty lady too. Beautiful needlework and a lovely tribute. I liked the story about Ida. I was an RN too that wore a starched cap! I graduated in 1963 though. I which I had kept my caps now and my pins!! What a lovely tribute! Her needlepoint stool is a treasure!! What great memories! The needlepoint stool is a great keepsake. Yes, I remember the stiff nurses hats and pins. What a loving tribute. I love that you have her nurses cap and a picture to go with it. Oh and the needlepoint is gorgeous. What a treasure the footstool is. That footstool is lovely- Really a great piece to remember Ida by. Thank you all for your lovely comments about Ida and her story. The older I get the more I appreciate what a great example she was of what a woman, mother and especially what a mother-in-law's role should be.